Boston receives a fair number of tourists each year and it seems this year there have been more tourists visiting our fair city than in the past few years. I wonder how much of that is due to the falling value of the dollar against foreign currencies making it more affordable for tourists to visit Boston? 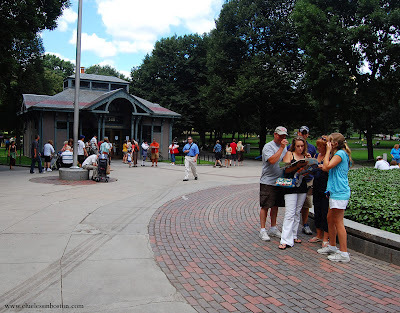 This is Boston Visitor Center on Tremont Street on Boston Common. Tours of the Common and Freedom Trail begin here, led by guides in period Revolutionary War dress. On really hot, humid days I don't know how they survive wearing those heavy woolen clothes.